Deepika Thathaal aka Deeyah – singer, composer and producer– is a versatile artist and a passionate human rights activist. She is Norway based Pakistani. Her father was a Pakistani and her mother was a phatan from Afghanistan. She was born in Norway and spent her time in America and England aswell. She released two critically acclaimed albums in Norway. Deeyah trained within the North Indian/Pakistani classical vocal tradition for more than fourteen years and had the rare privilege of being the only female ever to be trained by Ustad Fateh Ali Khan and one of very few females to be trained by Ustad Sultan Khan. She is also known as Muslim Madonna. She has got powerful vocals and i will definitely recommend her music to you. Everyone will tell you they think Woody Allen is a genius but few of them will have his films in their film collections. Zeb and Haniya, in that sense, remind one of Woody Allen. Indeed, the press attention this duo had received has been nothing short of extraordinary and in an even more unusual occurrence, the most artistic musicians in the country have lent a hand in producing their music. However, despite the fact that the press is making them out to be a national phenomenon, that isn’t the case, yet. Their music is too layered, too folksy and too bluesy to be understood by eardrums used to simpler fare. But what beautiful music it is: Zeb has a glorious and powerfully-understated voice and Haniya is a fitting accompaniment with her clean guitar-playing skills.Some of the hype surrounding them distracts from the real beauty in their music. As Pakhtun women, the torch of progress is forced upon them but their origins are incidental. What they need to be seen as is the new creative face that has changed Urdu pop. There was a time when people thought Urdu could not lend itself to rock, but then Junoon came along and changed the rules. 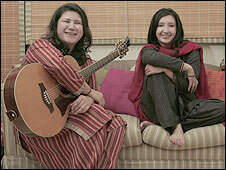 With Zeb and Haniya, the same has been done: a new canon of folk rock, jazz-influenced numbers and blues in Urdu has been created. That’s a lot for a debut album. F. Z.
Zeb and Haniya at Dawood Public School Concert! 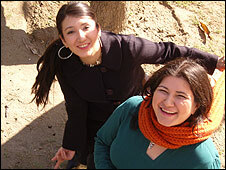 Nida Arab’s 3 songs have been added in female musicians library.